27 tracks from 1897-1923, 20-page booklet with historical notes, artist bios, and rare graphics. 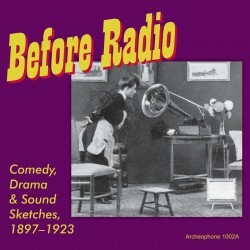 Includes monologues, dialogues, sketches, "descriptives," and much more from the days before radio. Standout stars are Ada Jones, Len Spencer, Steve Porter, Haydn Quartet, Weber and Fields, Golden and Hughes, Cal Stewart, and Will Rogers. Visit Before Radio's expanded catalogue page to see the complete track listing, read an extended description, and listen to sound samples.